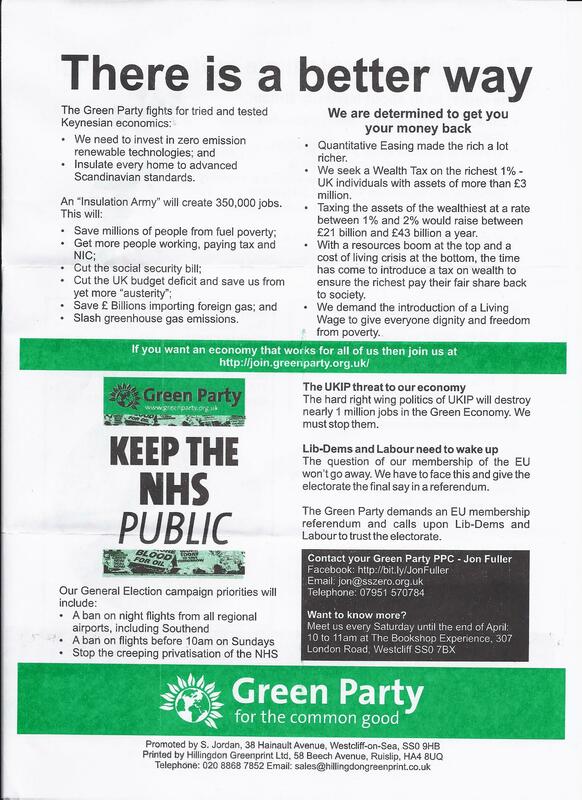 Another Green Party leaflet, another identikit personal statement. Barry Bolton, a former Parliamentary candidate, ought to be able to construct his own declaration. Labour did created the National Health Service. It is also the only Government that ever properly funds it. 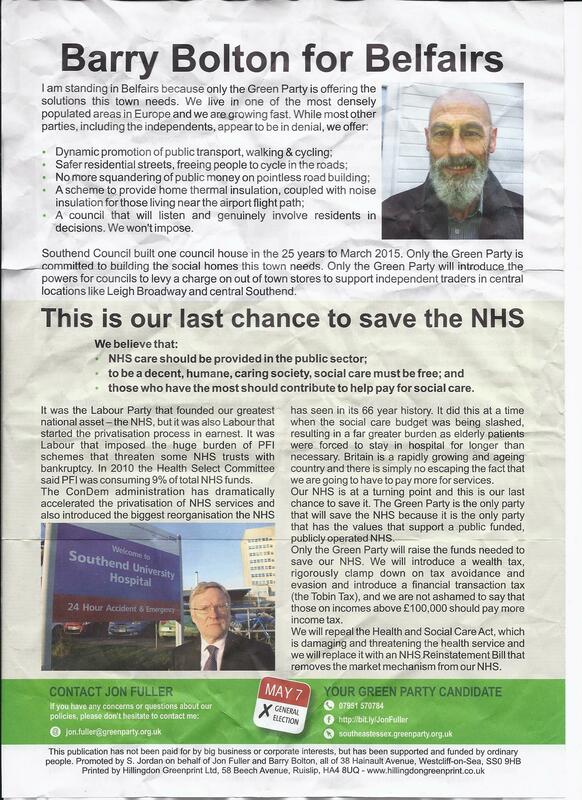 The Green Party are not going to win many, if any seats, yet they could deprive the one party who can save the NHS from being able to do this. If Jon Fuller really believes is “is our last chance to save the NHS” then he should be encouraging everyone to vote for me. Encouraging voters to indulge in politics of the money tree is to conspire to ignore reality. Whilst some Green policies are laudable, some seem to fly in the face of common sense. 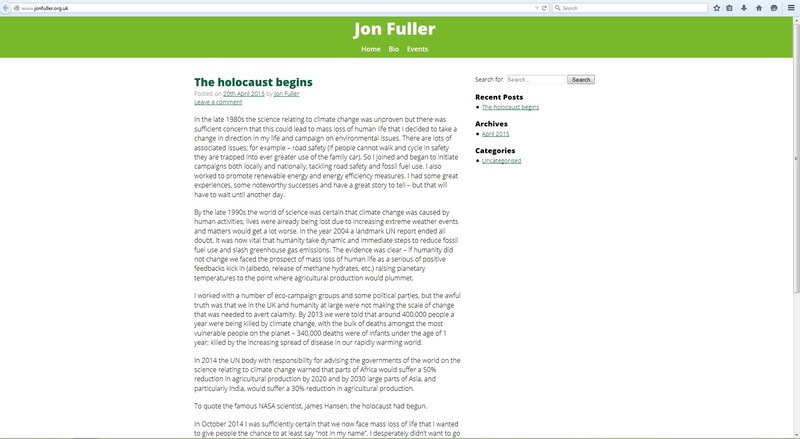 I also find the hyperbole here utterly unconvincing, and the messianic ramblings by Mr Fuller would have you believe the Green Party can defy electoral arithmetic and somehow deliver victory for Jon and his leader, Natalie Bennett. I would also add that belonging to an organisation like the European Union is only going to make efforts to combat any damage to the natural environment a lot easier to achieve. It is an irony that the climate-change obsessed party seeks to damage our chances of making the world greener by offering a referendum, which is not only distracting but also offers the possibility of our exit.